Falafel is sold on street corners in every city and town in Israel. Yom HaAtzmaut (Israeli Independence Day) coincides with spring. Celebrate with these Israel-inspired pinwheels, a fun craft that can be adapted for all ages. Plant the finished product in your garden, use them as a centerpiece, or let your kids play with them in celebration of the State of Israel. 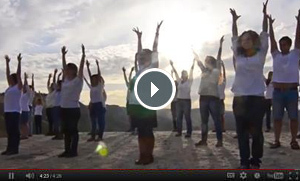 Watch The Ein Prat Fountainheads music video "Hope," in celebration of Yom HaAtzmaut, Israel Independence Day. Learn more about The Ein Prat Fountainheads. WHEN IS Yom HaZikaron & Yom HaAtzmaut ?